The White Mountains of New Hampshire offer not only beautiful hiking, but also so great fly fishing. With many streams supporting native brook trout populations, a day in solidarity can also become an awesome fishing experience. Some of my best fishing experiences were from hitting some of the pristine rivers up north. You can often find a remote place in which you won’t see anyone else for the whole day (if you know your way around). You can find miles of trout supporting rivers. Water levels can change frequently in these streams, greatly effecting the fishing, but with the right conditions, your day can be awesome. Check out our Fly fishing New Hampshire post to see all of the seasons. Bead Headed Prince Nymph – In faster water, the bead head helps a ton. This is probably my most successful fly all around NH. I make sure to practice catch and release on these rivers as the native trout population is important to keep healthy. It is also extremely important to avoid fishing when the water gets too warm. The mountain streams tend to stay cool enough, however during certain times, the water temperatures can be high enough to kill stressed fish. Even a relatively quick fight with a trout could potentially kill it. There are too many options to list out, and many of the streams, I couldn’t name myself. Whether you are looking for a larger river like the Pemi, Saco, Swift or Androscoggin, or looking for a small stream feeding into one of the state’s larger rivers, you will find native fish. Some of the most productive areas to fish for native trout are the northern headwaters of the larger rivers. The East Branch of the Pemi cuts through the White Mountains with various tributaries that will supply you with wild fish. Hiking trails are along many of these, and if you simply walk a ways out, you will likely be far from any other anglers. Nearly any nymph setup will be effective. 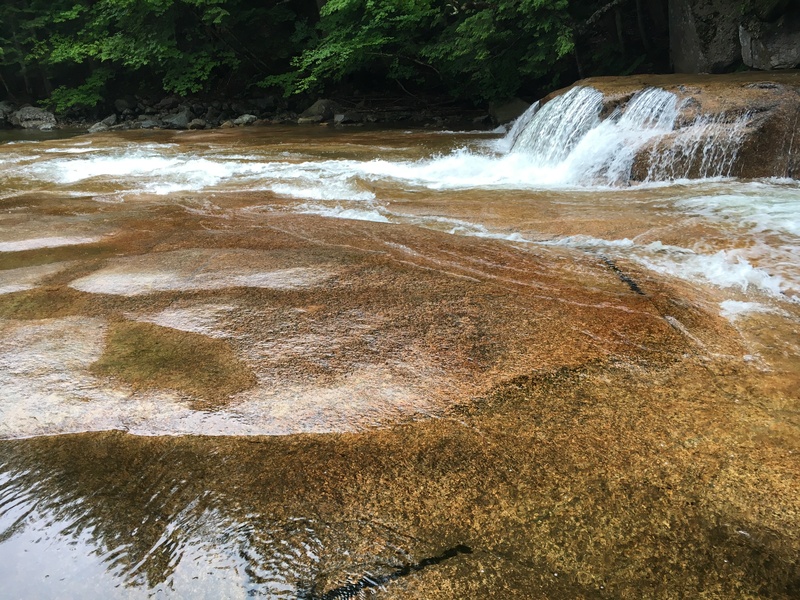 The swift river off of the Kancamagus highway has miles and miles of river supporting native fish. You will find pull-offs and hiking trails all along the river as well. In the summer months, the swift has many swimmers and tourists around. The Saco heads all the way into Crawford Notch, where Saco lake marks the beginning. You will find plenty of stocked fish in Saco lake, but also plenty of anglers. In the summer months, the Saco is crowded with kayakers, tubers, swimmers and anglers, but even here you can find paths that will remove you from most others. The Pemi rides along I 93 for most of the state, but as you enter the White Mountains, the fishing gets awesome. It is overfished and there is too much traffic on the Pemi, yet the fishing is still consistently good. From Echo Lake, to Profile, and all the way down to the connection of the East Branch, there are various opportunities to get away from crowds and still catch fish. Just have to take the time and look. New Hampshire also has fantastic trout ponds scattered across the state and in the White Mountains. Some are only accessible via miles of hiking, making them fantastic options for anglers looking to get away from most others. There are the two classic lakes in Franconia Notch, Echo Lake and Profile lake in which you are guaranteed to catch trout just about every outing. Many choose to float tube on Profile Lake. All of New Hampshire’s rivers are beautiful, but they are also all struggling from overuse, and harmful human behavior. Please respect these rivers, pickup, callout people when they litter, catch and release our fish populations, and do anything else possible to keep some of NH’s beauty. For small stream fishing like this, the lower weight rod the better. The natives in these mountain streams don’t get big. I didn’t include a picture, but my friend pulled out an 8 inch brookie out of these streams and we were very surprised. When using a 5-6 weight rod on these streams, there is simply no fight. That being said, it is still a blast. Personally, I am not picky when it comes to set up. Fly fishing is expensive as is, so having the perfect equipment for all situations is difficult without making a pretty substantial set up. In my opinion the most effective and versatile setup for all situations would be a 5-6 weight rod with just about any reel. This is because you can use it in just about every situation if you had to. Be sure to read our post on the best beginner fly fishing rod and reel setups.